Tropical cyclones, in contrast, typically have little to no temperature differences across the storm at the surface and their winds are derived from the release of energy due to cloud/rain formation from the warm moist air of the tropics ( Holland 1993, Merrill 1993). Structurally, tropical cyclones have their strongest winds near the earth's surface , while extra-tropical cyclones have their strongest winds near the tropopause - about 8 miles (12 km) up. 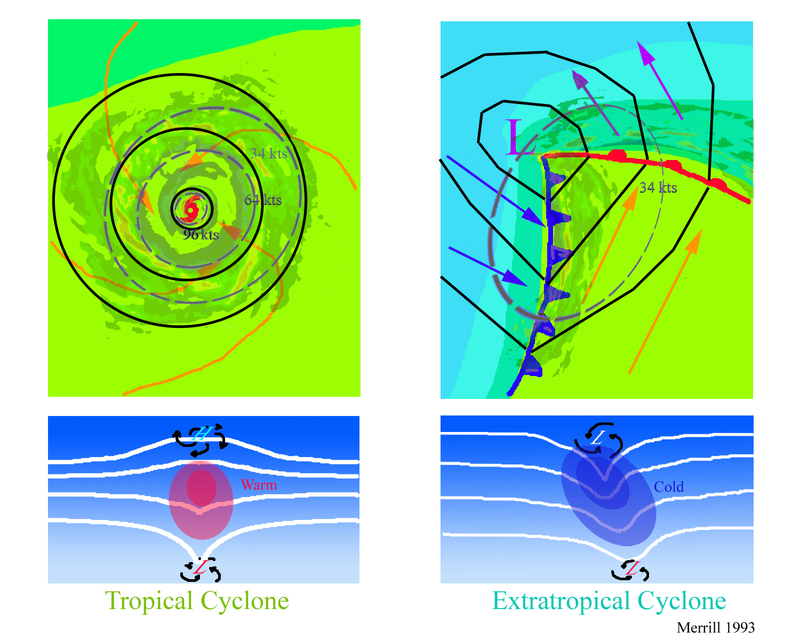 These differences are due to the tropical cyclone being "warm-core" in the troposphere (below the tropopause) and the extra-tropical cyclone being "warm-core" in the stratosphere (above the tropopause) and "cold-core" in the troposphere. "Warm-core" refers to being relatively warmer than the environment at the same pressure surface ("pressure surfaces" are simply another way to measure height or altitude).